When Apple announced the latest version of its popular smartphone, the iPhone 5, CEO Tim Cook proclaimed that their new device was the best iPhone the company has ever made. But is it the best phone on the market right now for business owners? Though it's a few months old, the Samsung Galaxy S III is still a hot phone thanks to its multi-carrier availability, large and beautiful display, fast 4G LTE capability, and robust performance. The iPhone 5 can boast all of that and more. The iPhone 5 finally broke the mold and expanded to 4 inches, up from 3.5. The resolution went up accordingly, and now you can enjoy 1136 x 640 pixels in the Retina display. Compared to many Android phones, including the 4.8-ich Galaxy S III, 4 inches feels a little on the small size these days. That can be a good or bad thing, depending on how much screen you want. For some, 4.8 inches is too big and more difficult to use one-handed. Four inches is stretching it, especially in that department. However, the almost (but not quite) 16:9 aspect ratio means the iPhone 5 is narrow compared to its height. The larger size also means fitting more on the screen, which can be a bonus for busy business owners. The iPhone's Retina display has a resolution, or pixel density, of 326 pixels per inch versus the GSIII's 306 ppi density. Technically, the iPhone's density is better, but not by so much that most people will be able to tell by looking. Where the iPhone 5 gives the GSIII real competition is with its camera. Apple upped the ante with its rear-facing 8-megapixel camera, adding a dynamic low-light mode and speeding up the picture-taking process. The GSIII's rear camera (also 8 megapixels) is fine but doesn't always perform well -- especially in low light. In front, the iPhone 5 finally has an HD camera (1.2 megapixels) that can record video up to 720p. This should make FaceTime chats even better and clearer. The Galaxy's front camera is 1.9 megapixels and also capable of 720p video. Apple claims its new A6 processor chip is twice as powerful as the A5 in the iPhone 4S. That means better, richer gameplay and more complex apps down the line. Meanwhile, the Galaxy S III's dual-core chip handily beat the iPhone 4S in performance benchmarks. It remains to be seen if the A6 offers as good or better performance. One aspect that could keep the Galaxy on top is that Samsung's phone has 2GB of RAM. The iPhone 4S had only 512MB when most phones had at least 1GB. Apple doesn't list it on the Apple website, but the iPhone 5 probably has 1GB. Apple claims that users can expect eight hours of battery life from the iPhone 5, even with the LTE capability, which traditionally draws a lot of power. The GSIII gets between eight and 12 hours depending on the usage and tweaks. Plus, if you need to go a super-long time without charging up, it's possible to carry and swap out an extra battery. A new iPhone means a new iOS, and version 6 adds a lot of useful features. It also takes away a few things, such as Google Maps and the YouTube app. Even though the iPhone 5's screen is bigger, apps will still work fine. Until developers update them, older apps will show in a letterbox-esque mode with black bars so you won't see any stretching or distortion. Apple apps are already optimized for the larger, longer display. Siri also gets an upgrade in this version, which makes her a more useful companion when searching for sports scores or movies. Since the iPhone now has three mics, she'll be able to understand you better, especially when on the road in noisy areas. The Galaxy S III is still running Android 4.0, which is one version behind the very latest from Google. The upgrade is coming and will bring with it Google Now and other Jelly Bean features. But even with Samsung's S Voice with the GSIII, it's often not as useful as Apple's Siri. Price: Are they worth it? The iPhone 5 starts at $199 for the 16GB version, $299 for 32GB, and $399 for 64GB with a two-year contract. Galaxy S III pricing starts out at $199 for 16GB with a contract on most carriers (T-Mobile costs more), but the carriers offering the 32GB version usually have it at $249, $50 less than the iPhone 5. There's no 64GB version of the GSIII in the U.S. 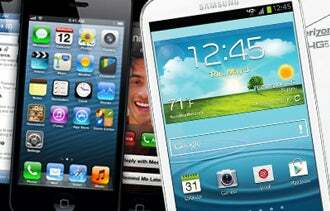 Both the iPhone 5 and the Galaxy S III have features that appeal to business owners with a range of mobile needs. Some will prefer the iPhone for the benefits of iOS and the huge app selection, the more compact design, or even better cameras. Others will choose the Samsung's GSIII for the bigger display, expandable memory, replaceable battery or less restrictive operating system.